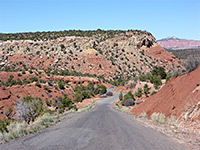 The 66 mile Burr Trail links Boulder on Hwy 12 with Notom-Bullfrog Road towards the south end of Capitol Reef National Park and on to Hwy 276 near Bullfrog Marina, beside Lake Powell. The western 30 miles cross the northernmost part of Grand Staircase-Escalante National Monument, and all the route is an excellent back-country drive - worth the journey for its own sake as well as for the access it gives to various remote trails, viewpoints and 4WD tracks. 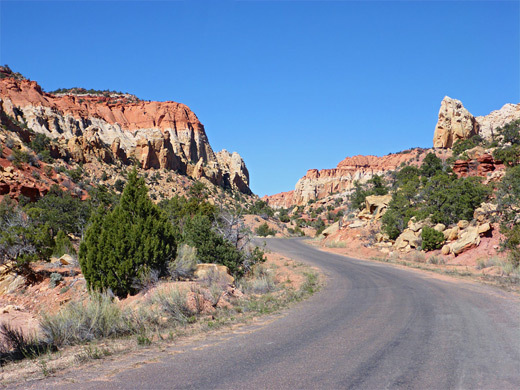 Garfield County officials decided to pave the western section of the route a few years ago, from Boulder to the Capitol Reef boundary, which has taken a little adventure out of the journey and increased traffic significantly. The NPS has no plans to pave the remaining portion so this remains more of a challenge, still usually passable by all vehicles although a very steep series of switchbacks over the far side of the Waterpocket Fold may be quite testing for some, while further east, the crossing of Bullfrog Creek is sometimes flooded. 23 views along the Burr Trail. 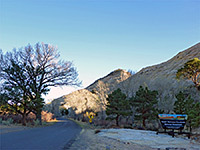 The west end of the Burr Trail is in the center of Boulder, where the highway bends from east-west to north-south; beside a restaurant and trading post. 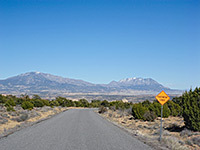 The road passes a few residences and fields then curves south, running along a wide valley beneath the towering white slickrock of Durffey Mesa, and soon entering the national monument, where the surroundings become completely undeveloped. 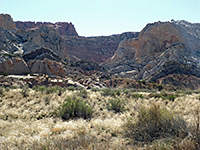 The route passes over a small plateau then crosses the first major drainage, Deer Creek, an all-year stream that may be hiked for a long distance either up or (usually) downstream; to the south the creek meets the Escalante River after about 12 miles, and several continuation hikes are possible. The four-site Deer Creek Campground (fees $10 per night) has a shady location between road and creek, while for free primitive camping there is one good location hereabouts, three miles east, along a short, sandy track on the north side of the road. Just after here the Burr Trail bends sharply and descends quite steeply into The Gulch, one of the most popular canyons in the national monument owing to the generally easy walking and beautiful, varied scenery. This is a prime backpacking trip (downstream) - to reach the Escalante usualy takes two days and there are several side canyons to explore. Upstream, the canyon is less-visited but still interesting; one close destination is a short slot canyon, 0.7 miles north of the point where the road leaves the streamway to the northeast. 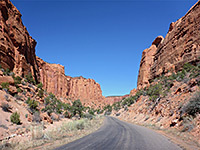 After crossing the Gulch, the road follows the floor of a major tributary, the appropriately named Long Canyon, a narrow, mostly sheer-sided drainage filled with much colorful, fallen rock. The streambed slopes upwards gradually, but the surrounding Wingate sandstone cliffs gain more height, so the canyon becomes deeper upstream. There is one tributary drainage of interest, just 0.7 miles from the junction with the Gulch, on the west side - known variously as Singing Canyon, Long Canyon Slot or Burr Trail Slot, this forms a 700 foot narrow passageway, before gaining height via an unclimbable dryfall. 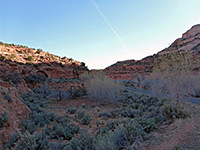 Towards the upper (northern) end of Long Canyon the road turns away up a side ravine and reaches a saddle at the rim of the Circle Cliffs, which are formed of a lengthy ridge of Wingate sandstone that curves right round to the east and forms the near edge of Capitol Reef. 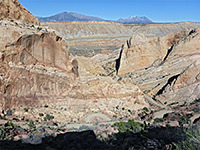 The saddle provides one of the best viewpoints along the drive, looking out across a colorful band of the Chinle Formation at the base of the cliffs, over the wooded plains beyond, to the peaks of Capitol Reef and the distant Henry Mountains. Following a short but steep descent down the edge of the Circle Cliffs, the Burr Trail follows a minor drainage between two flat-topped buttes and reaches a junction with the west end of the 33 mile Wolverine Loop Road, which heads south alongside two creeks to the Wolverine Petrified Wood Natural Area, notable for two good slot canyons (Little Death Hollow and Wolverine Creek), as well as the many pieces of petrified wood that are widespread across the region. The road continues, becoming rather rough, and eventually bends back northwards and meets the Burr Trail again at a second junction, 15 miles from the first. 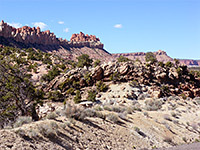 In between, along the trail, are two not-so-interesting ravines, Horse Canyon and White Canyon, the low, bushy summits of the Studhorse Peaks, and a wide, scrub-covered plateau (White Canyon Flat), on which are found several seasonal reservoirs, and a few dirt tracks to primitive camping sites. The Burr Trail becomes unpaved at the Capitol Reef National Park boundary, around the east edge of the broad flat lands beneath the Circle Cliffs; over the next few miles the ground slopes down steadily, by over 1,000 feet, and becomes more desert-like in appearance. The road rounds the north end of the far side of the Circle Cliffs, crosses a minor drainage that to the north and south forms Upper and Lower Muley Twist Canyon then arrives at the top of the Waterpocket Fold, overlooking much spectacular terrain ahead; it then descends another 900 feet over just 2 miles, switchbacking down Burr Canyon to the wide, flat-floored valley of Grand Gulch, where it meets the Notom-Bullfrog Road. The trail continues southeast for another 30 miles, along the gulch a short distance, though a gap in the east-side cliffs to an adjacent valley then across open plains for most of the way to Bullfrog Marina, with just one major drainage on the way, Bullfrog Creek, a crossing sometimes impassable during wet weather. The southernmost 20 miles of the road are paved.